On Saturday 30th June shortly after 5.15pm the fire on Ramshaw Moor was reported to Staffordshire Fire and Rescue Service. The fire currently covers an area approximately half a square kilometre in size and is being fought by 45 firefighters. 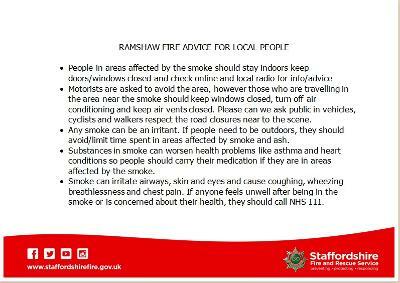 Please follow the latest advice from Staffordshire Fire and Rescue Service.